This October, in support of Domestic Violence National Awareness month, the National Network to End Domestic Violence (NNEDV), and HopeLine from Verizon are conducting the first ever effort to collect and catalog the stories of those affected by domestic violence. Called Journey of Hope, the 8-city cross-country tour kicked off on October 2 in Green Bay and ends in Dallas on October 28. At each tour stop, members of the domestic violence community, the public, and domestic violence victims and survivors can record their personal experiences on a Verizon Smartphone or tablet. The testimonies will then be posted on Facebook at facebook.com/Verizon (under HopeLine tab) to further the discussion about this community issue. Attendees can also donate their no longer used phones and text to donate to support the cause. Domestic violence is one of society’s last taboos. One in every four women will experience domestic violence in their lifetimes with the cost of intimate partner violence exceeding $5.8 billion each year, of which $4.1 billion is for direct medical and mental health services. HopeLine from Verizon gives consumers a way to help prevent domestic violence year-round by donating no-longer-used wireless phones and accessories from any service provider in any condition and turning them into support for victims and survivors of domestic violence. Since its inception, the program has collected over 8 million phones and has awarded more than 10 million in grants to domestic violence agencies and organizations throughout the country. Photo of the Journey of Hope bus at the Washington, DC stop on October 8th and 9th at the Taste of DC festival. Those who can’t attend in person can go to VerizonWireless.com/Hopeline to participate or text “HOPE” to 41010, to make a $10 donation to NNEDV, the largest network of state domestic violence coalitions in the nation. Donations will support NNEDV’s awareness and prevention efforts and provide domestic violence victims with necessary resources. Verizon will waive text-messaging fees and 100 percent of each $10 donation will go to NNEDV. The $10 donation will appear on the customers’ next regular monthly bill. Upcoming tour dates are: Chicago (Oct. 16) Los Angeles (Oct. 19) San Francisco (Oct. 20) and Dallas (Oct. 28). 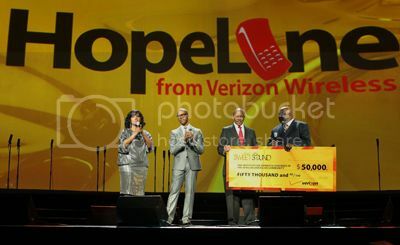 Top photo: At Verizon's How Sweet the Sound 2010 Finale on Nov. 13, 2010, in Washington, D.C., hosts Cece Winans and Donald Lawrence presented a $50,000 donation from HopeLine from Verizon to Dr. Oliver J. Williams of the Institute on Domestic Violence in the African American Community (IDVAAC). The donation will help the IDVAAC continue on its mission to raise awareness of domestic violence in the African-American community and demonstrates Verizon Wireless’ ongoing commitment to this important cause.